Drawing Together – A community-oriented and process-based coalition building art project. A community-oriented and process-based coalition building art project. “Drawing Together” version 2.0 is a series of monthly workshops of drawing and conversation with the goal of promoting art as a healthful addition to anyone’s life. These events are designed for non-artists, but all are welcome (kids, parents, adults, seniors, non-profit professionals, just to name a few). Materials are provided. All that participants need to bring is their interest in learning something new. April 17, 2019 – 4:00 – 5:00 pm at the Altadena Library, Speaker: Scott Feldmann, who is a creative consultant, teambuilder, writer, and designer. March 7, 2019 – 7:00-8:00 pm at the No Future Cafe, Speaker: Katy Robinson, parents, feminist, geographer, and co-founder of PHASIC House of Art and Science in CA. Dec. 19, 2018 – Cancelled…See you after the New Year! “Drawing Together” is a community-oriented and process-based coalition building project with advocacy as it’s goal with conversations around how art contributes to a culture of health in the city. From September 2017-April 2018 a series of conversations were held to engage community about the relationship of art and health, and drawing activities will be offered at each workshop. The final presentation of the first 9-months worth of workshops will take place on May 4, 2018 at the Armory Center for the Arts, and includes a selection of participants’ drawings that have been collected through the process, along with didactics about the relevant topics. The public is invited to discuss the intersection of art and health through structured meetings with the intention of convening a group of people interested in advocating for the health benefits of including art in the community. This framework aims to advocate for more art activation in under-served communities utilizing new formats of art. This project is produced by artist Jamie Crooke Powell. 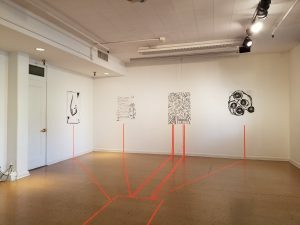 May 4, 2018 – 6:00-8:00 pm – Culminating Exhibition at Armory Center for the Arts. This project was made possible in part by a City of Pasadena Individual Artist Grant from 2017-2018.